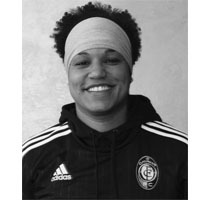 Ivonne Valentin is a Papillion native, 2007 graduate from Creighton University and a youth soccer coach in the Omaha Community. Her passion has been developing and teaching soccer to youth players. Since 2003, she has been involved with the Omaha Football Club as a mentor, trainer and coach. During her 2002-2007 academic career at Creighton, she was a leader and key player of the Women’s Soccer team. Immediately following, she assisted the Creighton soccer program in a variety of positions including Volunteer Assistant Coach, Assistant Coach and Director of Operations. During this time, she was also a liaison to various Omaha community programs and clubs. Additionally, from 2009-2011, she served as the Creighton soccer program Sports Assistant and Recreation staff members. As the “Coordinator” staff member of the Salvation Army Kroc Center in South Omaha, she created a youth soccer program serving youth ages 3-12 years old. Additionally, she assisted in the development of the Kroc Center adult soccer leagues. Having the experience of receiving an education and participating in a sport inspired Ivonne to continue to share that joey with others. Enthusiastically, she joined the SAVE Board of Directors in May 2015.